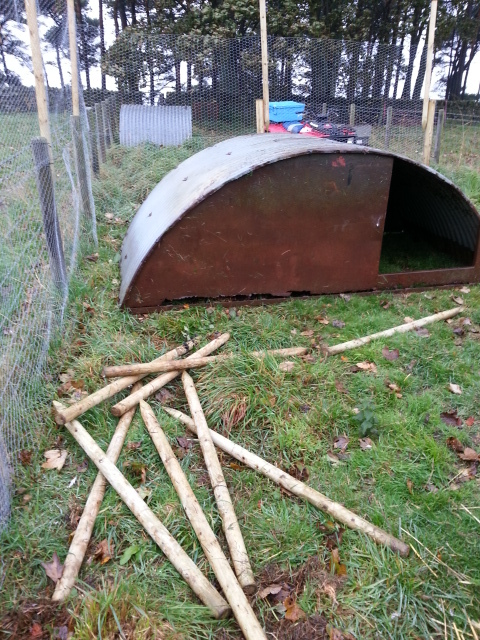 While constructing the new improved facilities on Chicken Lane, it seemed to be a fairly simple task to give them some additional shelter by moving a rusty old pig ark from an adjacent field. How hard could it be I thought? The answer is – very hard! – especially when there are just two people and they’re not entirely sure what they are doing. Luckily the old ark was already upside down under a large sycamore so, after clearing out the debris from years of neglect, it still proved to be too heavy for two people to lift over the stock fencing. No problem I thought, bring out the quad bike and drag it round through the gate. The quad is acting up a little but it eventually started (must get that starter/battery fixed!). We quickly managed to drag the ark out of the field behind the quad and made it two-thirds of the way before we reached a narrower point in the path. From here it wouldn’t have been wise to drag using the quad without risking damage to either the stock fencing or the main chicken house. We would have to resort to pushing/pulling but that didn’t look promising with our limited combined strength and the restricted space to work in. Luckily a flash of inspiration struck at this point and I finally found a use for the useless facts from school about the Egyptians building the pyramids. 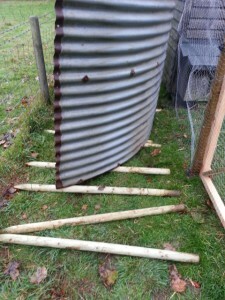 Our spare fencing posts would make great rollers and the ark could be simply rolled up the hill into place. This would make everything easier to handle and with luck would reduce the risk of any further damage to the rusty hulk as a result of our manhandling. Not quite as simple as described but was still a huge success and the move was completed with no further problems! 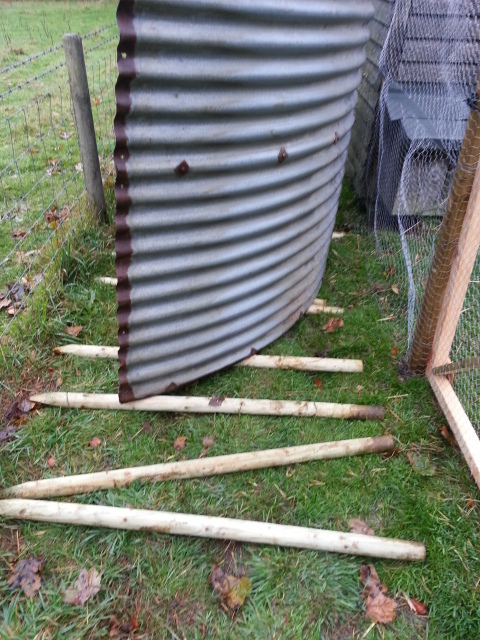 We can now put chicken feed under cover through the winter and it gives the chickens somewhere to shelter from the elements if needed. Once the ark was in place we were able to complete the remaining fencing work so that we could have a greater element of control over their coming and going!